Postnuptial agreement law is not easy to handle on your own because enforceability issues. California Postnuptial agreement requirements must be met in order to enforce such agreement. Our orange county postnuptial agreement paralegal will carefully negotiate between the spouses and draft with great care your agreement. Postnuptial agreement ( postnup ) is similar to prenuptial agreement, but postnup is entered into after a party is married. 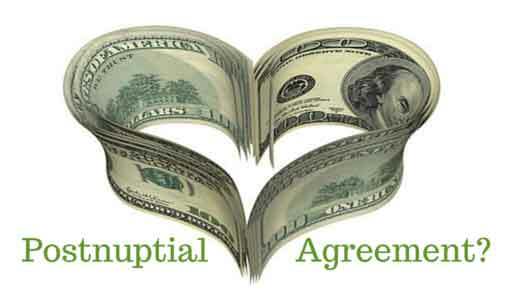 Prenuptial agreement and postnuptial agreement usually addressing same marital subjects. both spouses must fully disclose their finances in greatest details, including debts, liabilities, income and assets. If the court finds misrepresentation or fraud was involved, the agreement will be void. If the court finds misrepresentation or fraud was involved, the agreement will be void. In California postnuptial agreement spouses can’t contract or limit child support and child custody. All term that set or restrict child support or child custody will make the entire postnup unenforceable. Any court will look how fair your agreement to each of the spouses in order to enforce it. Our orange county postnuptial agreement paralegal will help you to come to an agreement about the values of asset important for each balancing the entire picture of the estate to be fair.